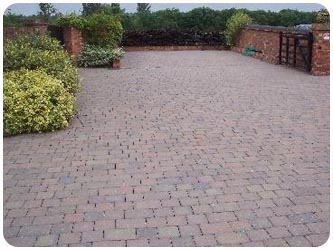 The appearance of your driveway is one of the first things visitors to your home notice, but truthfully who actually relishes the idea of cleaning their front drive or patio? In addition to just the appearance there are safety issues to be considered. The range of professional cleaning equipment used by our company, will solve these problem for you quickly and to a higher standard than is possible using DIY machines. 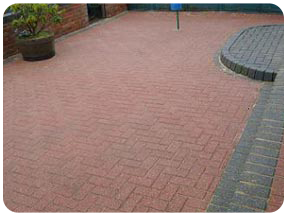 Furthermore the Hi-tech low level cleaner we use controls the removal of debris to a depth of 10 mm (0.4’’) in the joints of block paving and does not spray it all over the place. After pressure washing the displaced sand is replaced with sterile kiln dried sand which inhibits the re-growth of moss and weeds. 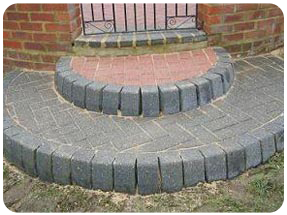 Does your driveway and entrance look like this? Then we are sure that you would prefer it looking as shown in the photographs below. The 50/50 clip to the right of picture (below left) showing the drive just after cleaning, shows the right hand section of the blocks re-sanded. 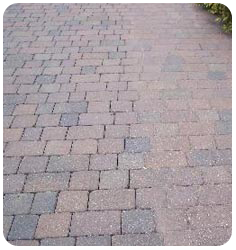 This underlines the necessity of re-standing the blocks with kiln dried sand after pressure washing to refill the joints and stabilise the blocks. When you invite your friends round for a barbecue you wouldn’t really want them to see your patio looking like the first two picture in this series. 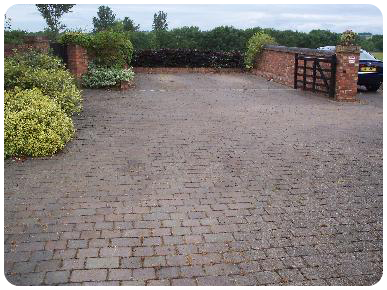 A makeover from our company, shown in the last two pictures of the series shows how we could bring your patio up to nearly new standard. 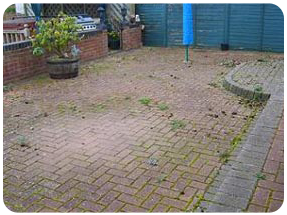 If you want to improve the ambience for your al fresco parties, then please give us a call.These results speak for themselves! 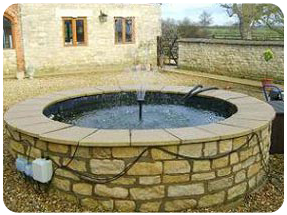 Special features built into patios and other hard landscaped areas present no difficulties and can be restored to their original appearance. 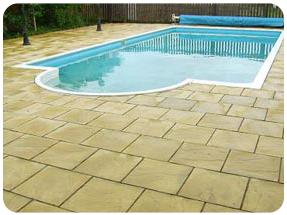 Swimming pool surrounds need special care when cleaning to ensure the pool itself is not contaminated. 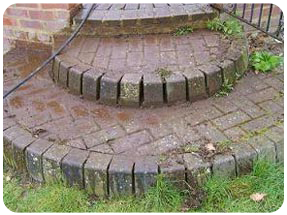 Let us solve your cleaning problems and contact us for a free makeover assessment of how we can restore your hard landscaped areas and features.